Chapter Five - Extra Cheez, Pleez! Click on the envelope below to receive e-mail notices when the blog is updated. This should open your e-mail program with a self-addressed message to us. You'll also need to click your program's Send button before closing it. We've come back to Tryon so His Muttness can be seen by his veterinary surgeon. Nothing life-threatening, but nonetheless something we needed to do. While still in Baileys Harbor we visited two sites worth sharing, and Judy took more photos of beautiful gardens and buildings. Her new photos are the last five in this album. Our first stop was the Baileys Harbor Range Light, erected in 1869 to help ships safely enter the harbor. Range lights are pretty cool because they're so simple and work so well. We often used them when sailing the Chesapeake Bay, though range marks without lights for daytime use are more common there. Here's how the Baileys Harbor lights are positioned: The front light is near the shore, while the rear light (shown above) is placed 950 further inland and 15 feet higher. A captain entering the harbor would see one light above the other and steer left or right until the lights appeared to be vertically aligned. At that point he was correctly positioned in the center of the channel. The original lights were replaced by a range mark and one light in 1969. You can see the original lower light and read a historical plaque by clicking on the above photo. The diminutive Boynton Chapel is truly a labor of love. In 1939 Winifred Boynton, who was deaf, needed a project to ease the loneliness of having most of her family and friends away in the war. Her solution was to build this model of a 12th century Norwegian stave church on the grounds of her summer residence, Björklunden. After the building was framed by a professional, Mrs. Boynton painted the 41 frescoes, and her husband did all of the exterior and interior carving even though he had no training nor experience. They required eight years to finish the project. 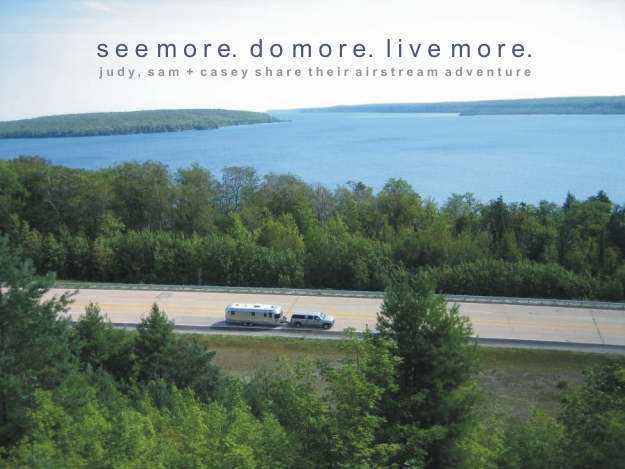 Take a moment to see Judy's interior photographs by clicking on the above photo. 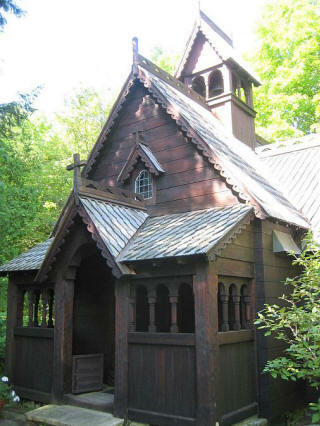 Today the chapel and Björklunden are owned by Lawrence University, a liberal arts university in Appleton, WI. Our student guide told us a wedding is performed at Boynton Chapel most Saturdays during the summer. You'd think they must be very small weddings as the chapel seats only about 25, but it's surrounded by a beautiful and expansive lawn stretching to the bay. The setting is beautiful and tranquil. Choosing it for a sacred event would be an easy choice. Our first stop after leaving Door County was Oshkosh, WI to visit the EAA AirVenture Museum. (The organization was formerly called Experimental Aircraft Association, but I believe they've shortened it to EAA.) Attentive readers will recall we had just arrived here last summer when we received the telephone call that ended that trip. 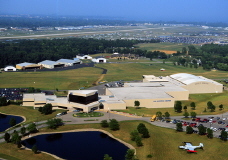 As you can see from this photo, the museum is mammoth, and includes a landing strip. 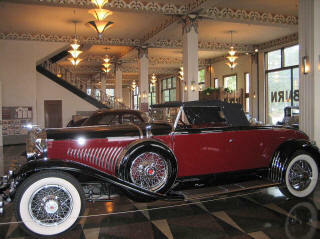 If you can only see one automobile museum in your life make it the Auburn-Cord-Duesenberg Museum in Auburn, Indiana. The cars would be magnificent anywhere, but they're displayed here in the restored art deco Auburn building. The combination is wonderful! This is a photo Judy took of the Auburn Model J sitting in the original Auburn showroom. The museum is also huge: 80,000 square feet on three floors, with displays of other important automobile brands in addition to the A-C-D's. Take a moment to watch this short video from WheelsTV, and then click on the photo above to see more of Judy's photos from our visit. This was probably our favorite stop on the trip. We wanted to check out the Notre Dame University campus in South Bend but decided against it when local TV reported mammoth traffic jams around campus because it was 'deliver the kid weekend.' Instead we visited the Oliver family home, Copshalholm. Perhaps you've heard of the Oliver Chilled Plow Works. Me neither. Anyhow, around 1868 James Oliver, who owned a foundry for making plows, discovered a way to cool the blade's front side so that it was smooth and hard while the untreated back side remained somewhat flexible. 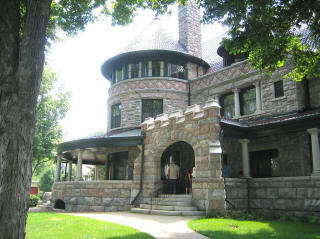 He became very rich and built a 38-room Romanesque Queen Anne mansion in South Bend. The house has two particularly interesting aspects: first, it's not pretentious. You may wonder, "how can a 38-room mansion not be pretentious," but it's really not. The rooms are comfortable sizes and rather cozy. There are just a lot of them, including nine bathrooms, which we were told was pretty unusual in 1895. The second item of particular note is that the furnishings are all original to the house. When James Oliver's grandchildren gave the home to South Bend they reportedly took only a few pieces of silver and mementos. Most museum houses we've visited are furnished with furniture and artifacts 'of the period.' 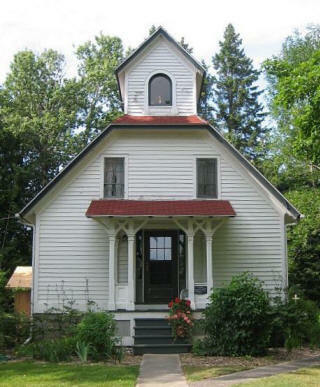 It's pretty special when a house is completely original. The Studebaker manufacturing company was also located in South Bend, and the Studebaker National Museum is adjacent to Copshalholm. We didn't go in, however, as we had seen a very nice Studebaker exhibit at the ACD Museum. This brought us to Saturday evening, August 23rd. We had an appointment with Casey's veterinarian the following Wednesday, so early Sunday morning we began two long days on the road and arrived back in Tryon Monday afternoon. Tropical storm Fay provided steady rain on Monday, but the truck and trailer both performed well. We love touring, but home always feels good. We came here because . . .
it's described as 'The Cape Cod of the Midwest' on page 575 of 1,000 Places To See Before You Die, and because our friends Trip and Alan recommended it so highly. We weren't disappointed. In fact, it's one of our new favorite places. If you read the previous post you know that we were fearful of meeting hordes of tourists, but it's OK, we've found them bunched in only a few places. 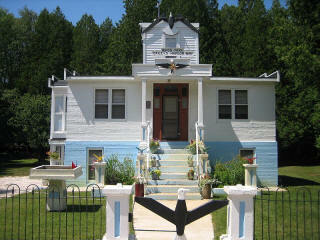 The Door Peninsula is a 75 mile skinny finger pointing into Lake Michigan from the northeastern corner of Wisconsin. With 300 miles of shoreline, the peninsula is blessed with myriad bays, beaches and harbors. Summer residents and tourists are concentrated in beautiful little harbor villages; including Baileys Harbor, Ephraim, Egg Harbor, Fish Creek and Sister Bay. Inland, the peninsula is agrarian. We mainly see cherry and apple groves, with a bit of grain and dairy farming thrown in. Did you know Brett Favre has come out of retirement and been traded to the New York Jets by his former team, the Green Bay Packers? We do. Man alive, do we! Here in Baileys Harbor our local TV comes from Green Bay, and they've been obsessed with it for the past week. Yesterday we watched a report that could have easily been mistaken for Favre's eulogy. It's sad to see him go because Favre is a God in these parts. He was well liked off the field for his charity work, and he was Mr. G.B. Packer to the fans. On the other hand, it sounds like the mourning period is ending and Packer fans are resolutely that. There are ten major Lighthouses on the Door Peninsula, with the newest one being 100 years old. We took Casey to the 89 foot Cana Island Lighthouse just north of Baileys Harbor a few days ago. It was built in 1869, automated in 1944, and is still in use as an important aid to navigation. The last major wreck occurred when the light was obscured by fog. 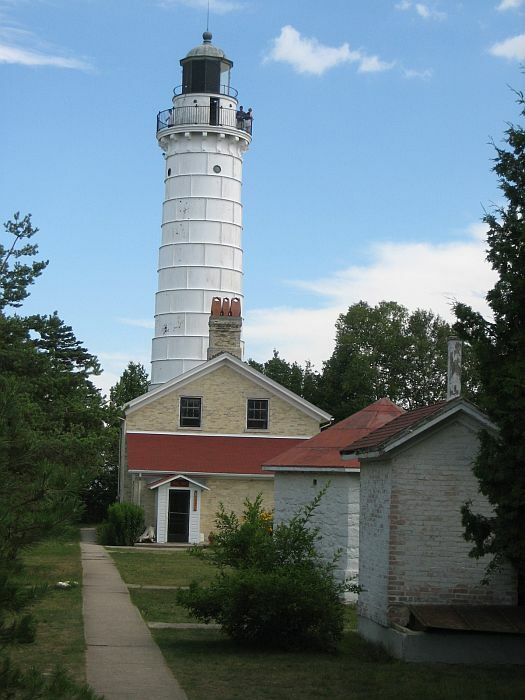 Off the northern point of Door Peninsula is Rock Island, WI, and northeast of it is St. Martin Island, MI. The two islands are separated by 'Death's Door,' a treacherous four-mile wide passage for commercial freighters steaming between Green Bay and Lake Michigan. In 1928 the 352 foot M.J. Bartelme carrying ore from Escanaba, MI down the peninsula to Milwaukee came safely through 'Death's Door' but fetched up on the rocky shore of Cana Island in dense fog and was lost. The crew was saved. Happily, the Sturgeon Bay canal that now connects Green Bay with Lake Michigan means ships no longer venture through 'Death's Door. How do you create a restaurant/gift shop empire that serves 2,400 people a day during the busy season? 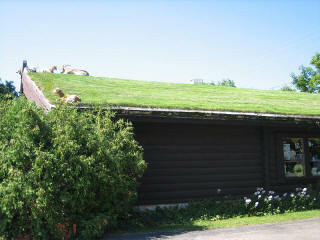 It's simple (though not taught in B-school): cover your roof with sod and graze half-a-dozen goats on it. 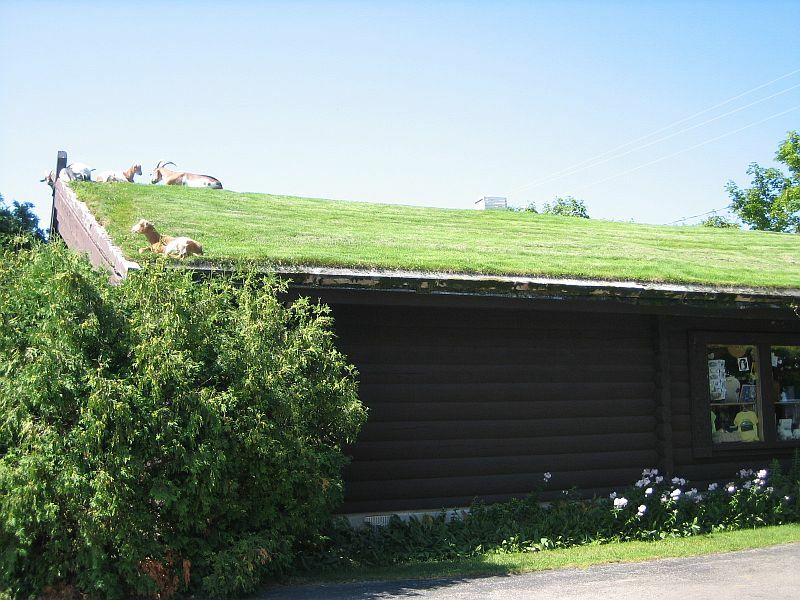 As you can see, that's exactly what Al Johnson did with his Swedish restaurant in Sister Bay. We haven't eaten there because the line is too long. We've spent considerable time here on the peninsula searching for a summer home to buy. Birds Park looks perfect to us. What do you think? We try again with Extra Cheez, Pleez! If you read the final post of Chapter Four -- Say Cheez!, disregard everything we wrote. None of it happened. We didn't go to the Texas Hill Country last winter, and we're not going east into New York State and Ontario this summer. What we did do was to spend last winter touring Florida in the trailer, while making two trips sans-trailer to Key West for important social events. This summer we resolved to resume the Say Cheez! tour where we left off, and that's where you've found us. We left Tryon Sunday morning, July 20th, and stopped for the night at a campground (see the map in the right-hand column) that's convenient to I-40 east of Knoxville, TN. Nothing interesting to report from there, but we like it because it's only about 2½ hours from where we store the trailer. 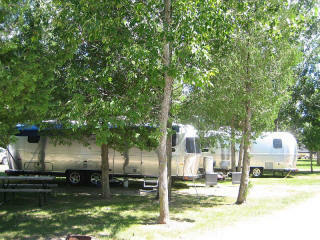 You're right, that's piddling for a day's tow, but it's great for the first and last days of a trip. On the way out, it allows us to attend to the final preparations for making the trailer ready, even if we've had a late start (read: every time). On the in-bound, last-night stop, it allows us to pack everything we'll take home into the truck and prepare the trailer for storage while we still have air conditioning, water and sewer connections. The next night we stopped at the Kentucky Horse Park Campground. It's a neat place, but we said more than enough about it in Say Cheez!, so I won't dwell further. Our first multi-night stop was a return to Shipshewana, IN, one of our most favorite places. This is Amish/Mennonite country, and we think it's wonderful. If you read the Lagniappe entry in Chapter Two: The Three T's Tour, you've probably had enough of our hype, but we're smitten. I haven't tired of nodding off each night to the rhythmic clip-clop of retired race horses pulling carriages in the distance. Clicking this picture will open a new window to view all photos. 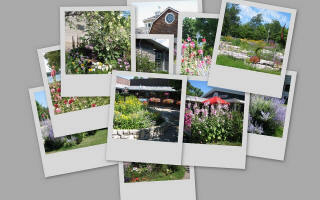 Once there, you can click on individual photos to enlarge them. We both agreed the museum is fabulous! Above is an example. It's the 1931 Mae West Housecar, made by Paramount Pictures to lure Miss. West away from the vaudeville circuit. Here's another of our special favorites. It's a 1937 Hunt Housecar. Judy did a great job photographing the vehicles with her digital 'point and shoot' in very difficult light conditions. 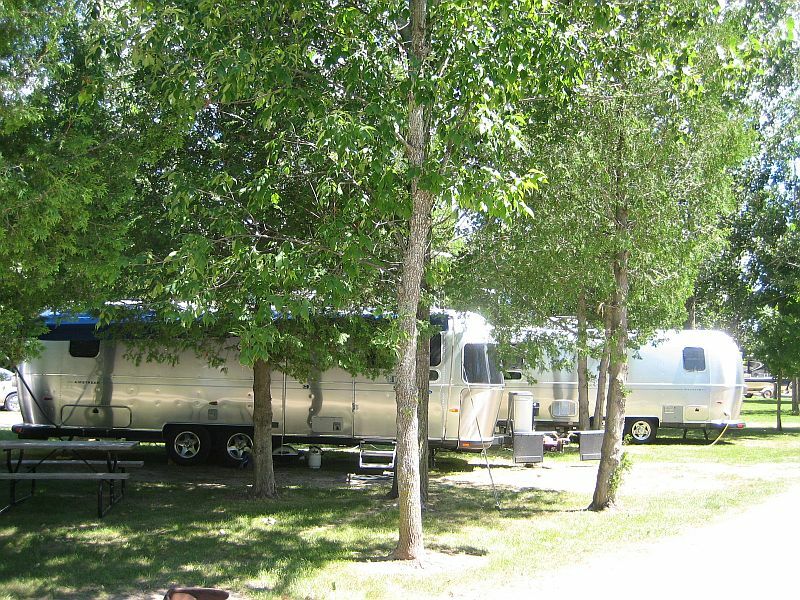 You can see more of these two, and several others, including the predecessor to Airstream by clicking on either of the above photographs. The next day we visited Hosterler's Hudson Auto Museum in Shipshewana. It was also worthwhile. Mr. Hostetler, whom we met, says he has assembled the largest collections of Hudson autos in the world. It's easy to believe, as we saw about 50, and he has more. The most impressive thing to me was that we never felt like we were seeing the same car twice. Hudson made a wide range of autos, and Mr. Hostetler seems to have all of them represented. This is Herself in front of a 1928 Four Door Town Car. It's the rarest and most expensive in the museum. We had a great (and surprising) time in Milwaukee's Historic Third Ward district. From its roots as a turn-of-the-century warehouse and manufacturing district, the Third Ward has morphed into 12 square blocks of urban energy. The street level is lively clubs, restaurants, shops, and galleries; while upstairs, the old mid-rise buildings are now condos and apartments. It's hard to imagine better for a person who wants to live in an urban environment (at least in the summer). The lakefront is anchored by the Milwaukee Art Museum with its spectacular Quadracci Pavilion. The Pavilion's signature brise soleil wings form a moveable sunscreen with a 217-foot wingspan. The brise soleil is made up of 72 steel fins, ranging in length from 26 to 105 feet. The entire structure weighs 90 tons. It takes 3.5 minutes for the wings to open or close. Sensors on the fins continually monitor wind speed and direction; whenever winds exceed 23 mph for more than 3 seconds, the wings close automatically. The wings open and close several times a day, wind speed permitting. We saw them in both the open and shut positions, but were not lucky enough to see them moving. Today we visited Kohler Village, established by the Kohler Company in 1917 as a planned community. the present population is about 2000. We don't know if it's now only Kohler people, but we can say with complete assurance that they live in Disneyland. The town, which consists of several housing areas, a newish shopping center, the Kohler offices/plant and the America Club, is pristine beyond belief. The American Club is a AAA 5-diamond resort. For us, the best part was that it isn't huge. The scale is comfortable, and the gardens are serene. We had lunch in the basement Horse & Plow restaurant, said to be the former tap room for Kohler employees. It was very good. That was followed by an even better dessert in the Greenhouse. The Greenhouse, including beautiful stained glass windows, was built for an English hospital around 1879, and eventually found its way to America and to Kohler.